It was also in 1965 that the borough of Spelthorne was transferred from Middlesex to Surrey. Smaller areas have been shunted back and forth between counties over the years. 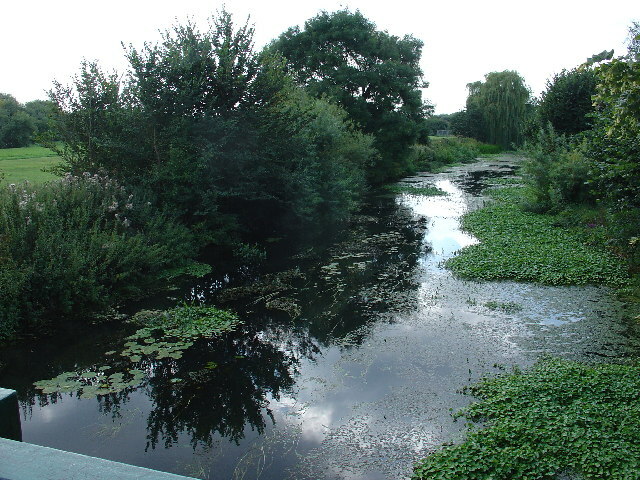 However, although large areas of Surrey were hived off to help make up the new administrative district of Greater London, for postal purposes these areas are often still described as being in Surrey. 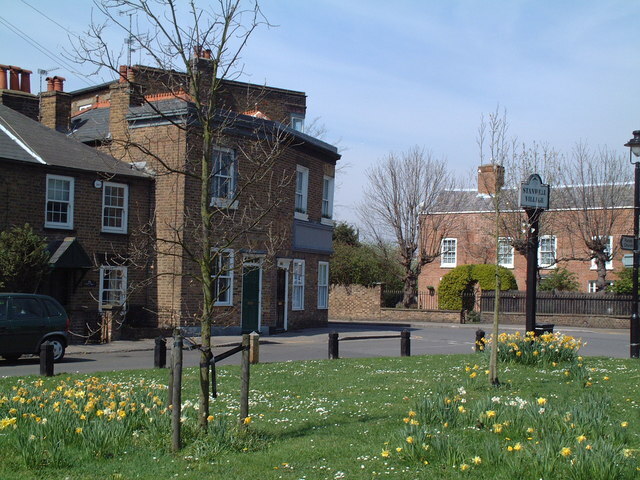 The website for the London borough of Sutton, for example, lists all the primary schools in Sutton as having addresses in Surrey, and Spelthorne College still gives its address as being in Middlesex. So the fact that the postal address of Little Whinging is in Surrey does not preclude it from being in one of the areas which is now administratively under the Greater London Council. Harry had never been to London before. Although Hagrid seemed to know where he was going, he was obviously not used to getting there in an ordinary way. He got stuck in the ticket barrier on the Underground and complained loudly that the seats were too small and the trains too slow. 'I don't know how the Muggles manage without magic,' he said as they climbed a broken-down escalator that led up to a bustling road lined with shops. Up another escalator, out into Paddington station; Harry only realised where they were when Hagrid tapped him on the shoulder. When Harry makes his first trip to Diagon Alley in PS, he and Hagrid start off from the island where the Dursleys had taken refuge and travel into London, and then later Harry returns to the Dursleys by catching a train at PaddingtonO3C. We aren't told whether he is returning to Little Whinging, to meet them at the house, or whether he is rejoining them on the offshore island where he had left them that morning. However, the island was definitely at sea, not in a lake or river. Trains from Paddington head inland, across the middle of England: on a Paddington train the nearest bit of shoreline you come to is over a hundred miles away. If Harry was heading to the island from Paddington then he would have a hundred-plus miles' journey ahead of him and he would have already travelled that far to get from the island to Diagon Alley that morning, and there's no suggestion that Harry and Hagrid's train journey to London was anything like that long. The only way you could get from Paddington to an island less than a hundred miles from London is by changing trains in order to get to somewhere like Brighton or Southampton; but those are still quite distant, and in any case they are served by much more direct trains from WaterlooO5E, which is easier to get at from Diagon Alley than Paddington is. It just wouldn't make sense to go via Paddington. So we can be fairly sure that when Harry caught the train at Paddington he was heading for Little Whinging to meet the Dursleys there; not returning to the island where he had left them that morning. Vernon's island was probably on one of the nearer bits of the Sussex, Kent or Essex coasts, about forty miles from Little Whinging but – at least in the case of the nearer reaches of Essex and Kent – only about thirty miles from Diagon Alley. Harry travelled from the island to central London and thence back to Little Whinging, meeting the Dursleys there. On their way in from the island to Diagon Alley, Hagrid declares the intention to go to London, then they reach the station and look at the time-table, then there is some conversation at the station. Then follows a scene-break, then a reference to being in London, then a description of Hagrid having trouble with the ticket barriers for the Underground, then he is described as complaining about the trains on the Underground, before they get off. It seems clear they did not simply come in on the Underground all the way and then get off it, and indeed, the Underground does not in fact extend as far as the sea in any direction. They must have come in on a mainline train and then transferred to the Underground. The description of passing "hamburger bars and cinemas" en route between the Underground station and Diagon Alley does not sound at all as if they are approaching Charing Cross Road from the east side, through Covent Garden, nor from the west through Leicester Square which would be cinemas, clubs and Chinese restaurants: it sounds much more as if they are walking along Charing Cross Road itself. Yet, they probably didn't walk north up Charing Cross Road from Charing Cross stationO5D or EmbankmentO5D, because Harry does not mention passing through or by Trafalgar Square – which is possibly the most noticeable and readily identifiable place in Britain - en route to the Leaky Cauldron. So they must have walked south down Charing Cross Road, starting either at Tottenham Court Road stationO5C at the northern end, or Leicester Square stationO5D in the middle. Leicester Square is the main cinema area in London, and either way if they were walking south down Charing Cross Road they would pass by the edge of it. I initially thought that Vernon's island must be off the coast of Kent or East Sussex, and Harry and Hagrid caught a mainline train to WaterlooO5E and then changed onto the Northern Line for Leicester SquareO5D. However, that doesn't work, because trains from Kent and East Sussex which go to Waterloo actually go on to Charing CrossO5D, and you would expect them to just get out there and walk via Trafalgar Square, instead of changing to the Underground: it's only about a hundred yards further from the Leaky Cauldron than Leicester Square is. They would have to go as far west as Hampshire to catch a mainline train from the coast which went to Waterloo and didn't go on to Charing Cross. 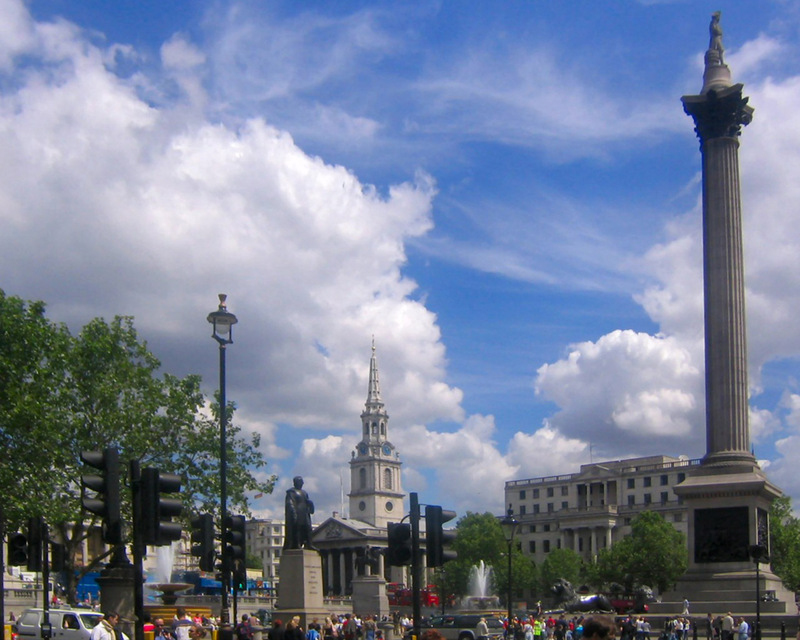 Nor is it likely that the island was off West Sussex, because trains from there would go to VictoriaO4D and from Victoria the natural thing would be to catch the District or Circle Line to EmbankmentO5D and, again, walk up past Trafalgar Square. 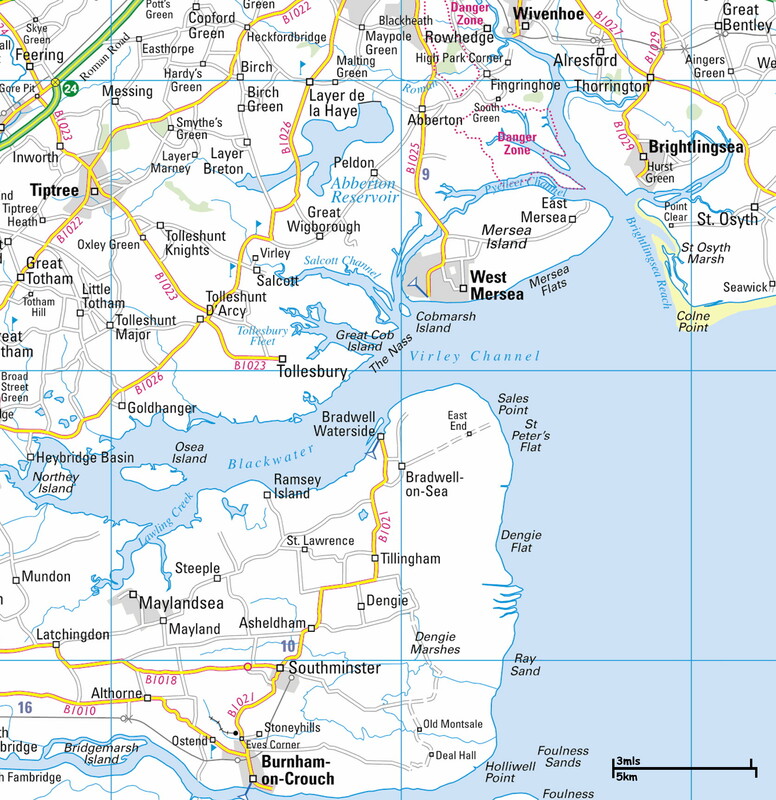 Instead, Vernon's island pretty-well has to be off the coast of Essex: or perhaps Suffolk if they ventured further north. Trains from Essex come into London at either Liverpool StreetO6C or Fenchurch Street. Fenchurch Street is purely a mainline station and they would have had to come out into the street and walk to an underground station, but Tower HillO6D and AldgateO6D are both nearby. From any of these they could get the Circle Line (or from Tower Hill the District Line too) as far as EmbankmentO5D, which is at the back of Charing Cross, but then we have the same problem: it's so near to Diagon Alley that you would expect them to walk rather than getting the Northern Line, but if they walked from Embankment they would have gone through Trafalgar Square. They might have got the Circle Line going the other way and then changed onto the Piccadilly Line at King's CrossO5C. But the neatest solution is that they came in at Liverpool Street stationO6C, changed onto the Central Line and then got off at Tottenham Court RoadO5C and walked the whole length of Charing Cross Road. This means that Vernon's island was in an area of Suffolk or Essex which is served by trains which go to Liverpool Street. 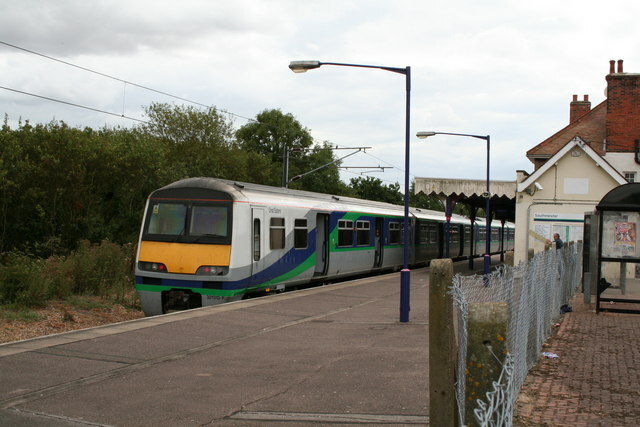 Trains to Fenchurch Street serve the south coast of Essex as far as Shoeburyness, a suburb just to the east of Southend: so we know Vernon's island must have been significantly further around the coast than Southend. It's probably somewhere in the frilly, involuted, marshy bit of coast around the Blackwater Estuary, north of Southend and east of Chelmsford, as there are many small islands there: including dozens of tiny, apparently nameless ones which are too small to show up on the accompanying map, but can be seen if you start at Cobmarsh Island on Streetmap.co.uk and then scan around the coastline in high definition. It's true they are embedded in mudflats but they would be surrounded by salt water at high tide, and it's about the only suitable area where they might find such a small island. Harry and Hagrid would pick up the train either at Southminster (near the bottom of the map), or at Wivenhoe or Alresford (both near the top of the map), any of which would take them to Liverpool Street stationO6C. From there they would take the Central Line to Tottenham Court RoadO5C, and walk down Charing Cross Road, past all the fast-food joints and the edge of the cinema district at Leicester Square. So, we can be fairly sure that the train Harry caught at Paddington was heading for Little Whinging: but that's rather peculiar considering that Little Whinging is meant to be in Surrey. Trains to the eastern part of Surrey go from VictoriaO4D or Charing CrossO5D, but we can at once rule out Little Whinging being in the eastern part of Surrey, because if you head from central London towards east Surrey you aren't going in even vaguely the same direction as the trains from PaddingtonO3C. Little Whinging must be in the western part of the county. However, although western Surrey is at least in the same general direction as the area served by trains from PaddingtonO3C, trains to the west part of Surrey in fact go from WaterlooO5E. Trains from Paddington go not to Surrey but to Berkshire, the next county north of western Surrey. Furthermore, trains from Waterloo cover the whole of Surrey almost to its northern border from the outset, and heading further west they cross over to Ascot, in the south of Berkshire, and even to Reading. And Waterloo is a lot easier to get to from Charing Cross Road than Paddington is: Paddington is seven stops from Charing Cross stationO5D on the north-bound Bakerloo Line, Waterloo only two stops south on either the Bakerloo or Northern Lines. 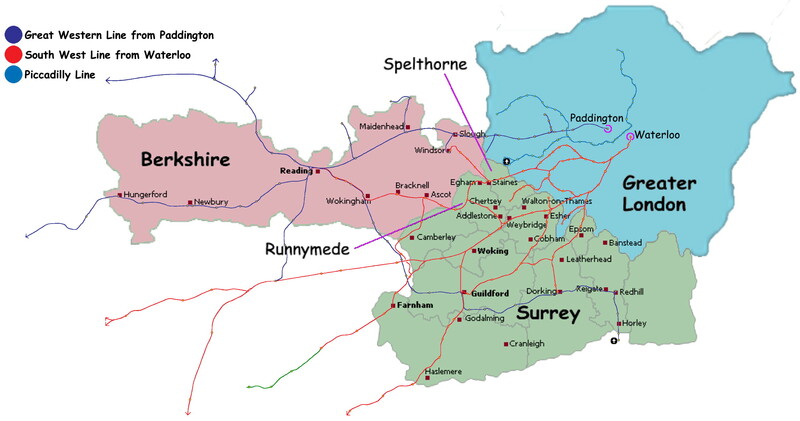 It's true that there are some stops in the south of Surrey, between Guildford and Reigate, which are served only by Great Western Line trains (from Reigate eastwards the stations are also served by trains from Victoria or Charing Cross, not shown), and the Great Western Line runs out of Paddington. But to get to those stops from Paddington you would have to get the train west to Reading, change trains and double back - and you could get there quicker by getting a South West Line train from Waterloo into Surrey and then changing trains at Guildford. To get to Ash, for example, which is on the edge of Surrey and the first stop in Surrey which you would come to by doubling back on the Great Western Line, would take twenty-two stops via Reading, and twenty via Guildford - bearing in mind that the Guildford train is also a lot easier to get to from Diagon Alley. As you move east of Guildford the difference is greater - to get to Betchworth via Reading, for example, would be thirty stops, and via Guildford twenty-four. If you went to Charing Cross mainline station (within easy walking distance of Diagon Alley) you could catch a Southern Line train (not shown on map) and get to Betchworth in nineteen stops, changing at Redhill. Hence, it makes no sense for Harry to start from Paddington in order to reach any of the stops in Surrey which are served by Great Western Line trains: he would start from Waterloo or Charing Cross. It's no good assuming that Little Whinging is in one of the bits which used to be in Surrey and are now in Greater London, either. Apart from RichmondO2E, which they would get to by walking to Embankment stationO5D - which is just behind Charing Cross station, facing towards the ThamesO5D - and then getting the District Line, they too are accessed only by trains from Waterloo. In order for Little Whinging to be in Surrey and yet it be easier to get to it via Paddington than Waterloo, it has to be in one of the boroughs on the very boundary between Surrey and Berkshire. It isn't in Surrey Heath, either, because when you get as far west as Surrey Heath the trains from Waterloo actually cover southern Berkshire as well, and the direct trains from Paddington don't pass anywhere near - only the doubled-back line from Reading which, as already discussed, works out considerably longer and less efficient than going from Waterloo. That means it's in the borough of either Spelthorne or Runnymede - the only bits of Surrey which are reasonably close to the section of the Great Western Line between Paddington and Reading. If we suppose that Little Whinging is in the north of Runnymede, near Engelfield Green (a on the accompanying map, below right), Harry might be taking the train from Paddington to Windsor station (in Berkshire, b on the map), which is about four miles from Engelfield Green. Although Windsor is served by trains from both Paddington and Waterloo, according to The Royal Windsor Web Site the train from Windsor to Paddington takes about half an hour - six minutes from Windsor to Slough (top left of map), then a change of trains, then twenty-two minutes to Paddington - whereas the journey from Windsor to Waterloo takes over fifty minutes. However, any location which was in Surrey and yet readily accessible from Windsor would have to be well under two miles from Egham station (c on the map, just to the right of Engelfield Green) in Surrey, which itself is only about thirty minutes on the train from Waterloo – and Waterloo, remember, is much easier and quicker to get to from Diagon Alley than Paddington is. So unless the line from Waterloo was closed for repairs it really makes no sense for Harry to get to Little Whinging via Windsor. If Little Whinging were in Runnymede he would get the Waterloo train to Egham. Alternatively, Little Whinging could be in the north of Spelthorne, in the vicinity of Stanwell Moor (d on the map, just left of Heathrow Airport). Stanwell Moor as it stands is probably too small to be Little Whinging. However, in the real world there was an expectation that when the airport was enlarged there would be an expansion of housing in the Stanwell Moor/Poyle/Colnbrook area, which in fact never materialised: but we can guess that in the Potterverse it did and a new village grew up next to Stanwell Moor - or that Stanwell Moor itself expanded, and Little Whinging is a pseudonym for this enlarged area. Stanwell Moor is about a mile and a half in a straight line or two and a quarter miles by road from Staines station in Surrey (e on the map, just below the bottom of the King George VI and Staines Reservoirs), on the south-west line from Waterloo to Windsor and Reading; and two miles in a straight line or two and a quarter by road from Iver station (which is at Richings Park, south of Iver itself, f and g on the map) in Berkshire, on the Great Western Main Line from Paddington. If Little Whinging is near Stanwell Moor the Dursleys, or a taxi driver, might find it more convenient to pick Harry up from Iver station because it's right by the M25 and they could drive straight down the motorway to Stanwell Moor instead of weaving about the side-roads of Staines, even though it means that at the London end Harry has the inconvenience of going via Paddington rather than Waterloo. Note that in real life there does not in fact appear to be any easy way up from Iver station onto the M25: but if the expected expansion of housing in the area had actually happened, and had generated Little Whinging, a new slip-road might well have been put in in order to improve access. 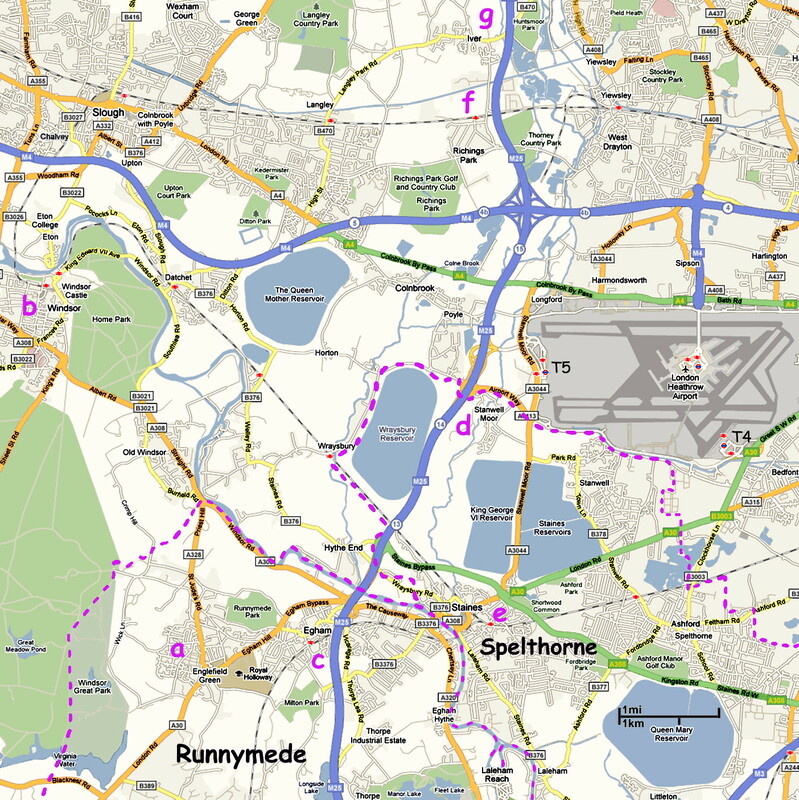 Also note that in 1991, the Heathrow Terminal 5 station near Stanwell Moor itself (T5 on the map) hadn't yet opened. Terminal 5 was first mooted in 1992 and built between 2002 and 2008: during the period covered by the Harry Potter books the area near Stanwell Moor which is now Terminal 5 was a sewage farm. Even the mainline service to Terminals 1-4 hadn't opened yet, although there was a Piccadilly Line Underground train. The problems with the Stanwell Moor option are three-fold. Firstly you have to assume that the Ministry, despite how old-fashioned the wizarding world generally is, used the modern post-1965 designation of Spelthorne as being in Surrey, rather than the older – and still generally used - postal address in Middlesex. Then, you have to explain why Harry and Hagrid didn't simply get the Piccadilly Line Underground train from Leicester Square stationO5C, which must be about five minutes' walk from Diagon Alley, to Heathrow Terminal 4O1E (halfway down righthand side of map), just over two and a half miles from Stanwell Moor. But at that time, in 1991, there was no mainline service to Heathrow, so the Underground train must have been horribly crowded, and perhaps the mainline train just seemed the better bet. Even though they could have walked to Leicester Square station and then got the train straight through on the Piccadilly Line, and even though Terminal 4 is slightly nearer to the putative site of Little Whinging than Iver is, eleven-year-old Harry would hardly be walking home, or getting the bus, carrying a pile of books and clothes, a cauldron and a live owl. If he was getting a taxi, or the Dursleys were meeting him, it might be easier to do so at Richings Park where there would be less traffic, and a mainline train would provide more space for his luggage. Then again, he had to carry the owl etc. on the Undergound just to get to Paddington. Perhaps Hagrid didn't actually realize the Underground went all the way to Heathrow, and so put Harry on a mainline train by default. It would make better sense if Hagrid had been actually planning to accompany Harry on the train home, since he would fit much better in a mainline carriage than crammed into a tube-train for quite a long journey – but we know he stayed behind on the platform. The third problem is that it puts Little Whinging about a mile from the third busiest airport in the world: but Runnymede isn't much better from that point of view, and it has to be one or the other. Little Whinging really has to be in the Stanwell/Stanwell Moor region of north Spelthorne, or at a pinch somewhere slightly north or north-west of Engelfield Green in Runnymede, because those are the only areas of (more-or-less) Surrey which it makes the remotest sense to access by means of a train from Paddington. Stanwell itself (between Heathrow Airport and the Staines Reservoirs) is a pretty, rather old-world village, but both Stanwell Moor and the neighbouring town of Staines contain exactly the sort of modern housing that the Dursleys' home almost certainly is (older houses aren't found on estates with themed names like Privet Drive and Magnolia Crescent). Stanwell Moor village is only about two thirds of a mile across, which seems a bit small for Little Whinging – but we can assume that in the Potterverse, Stanwell has mushroomed out into a second modern satellite village, alongside Stanwell Moor, or Stanwell Moor itself has expanded into something a bit bigger. It has been suggested that the actual layout of Little Whinging, with its streets and parks connected by alleyways, might have been inspired by the modern town of Yate, about ten miles north-east of Bristol. This is actually possible because it's just across the Severn Bridge from Chepstow where JK Rowling lived as a teenager, so she may well have been familiar with it. However, small though it is Stanwell Moor also seems to have crossing alleyways linking its streets. It does actually have a street called Vine Close (and a parallel street called Minerva Close! ), and you can easily imagine that if it had grown it might have gone with that theme and had its Privet Drive and its Magnolia Crescent. The playground at Little Whinging wouldn't look much like the one in the films. 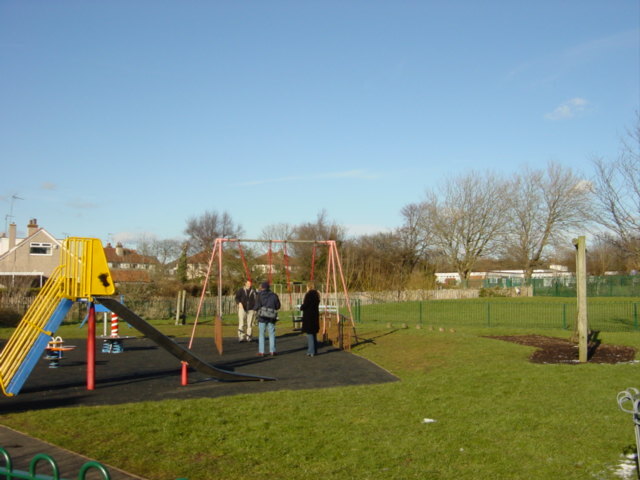 You do get playgrounds in bleak, exposed areas like that in underpopulated moorland areas, but hardly in Surrey, and reasonably modern playgrounds in expensive areas like Little Whinging are usually chunky and very brightly-coloured. They soared right [if south is to the right they were heading east before] to avoid passing directly over the glittering spider's web of lights below. They altered their course every now and then according to Mad Eye's instructions. [cut] [Harry] wondered how long they had been flying, it felt like an hour at least. Of course, if we assume that Vernon's island is right over on the west coast, and it was for that destination that Harry caught the train at Paddington, travelling over a hundred miles each way, then we can place Little Whinging anywhere we like in Surrey. It makes sense, though, to have Little Whinging in the very far north of Surrey because when Harry, Moody, Tonks and co. fly from the Dursleys' house to Grimmauld Place in OotP, they are repeatedly described as heading south or south-east, and yet they end up somewhere within (as we already know) about a mile of King's Cross. 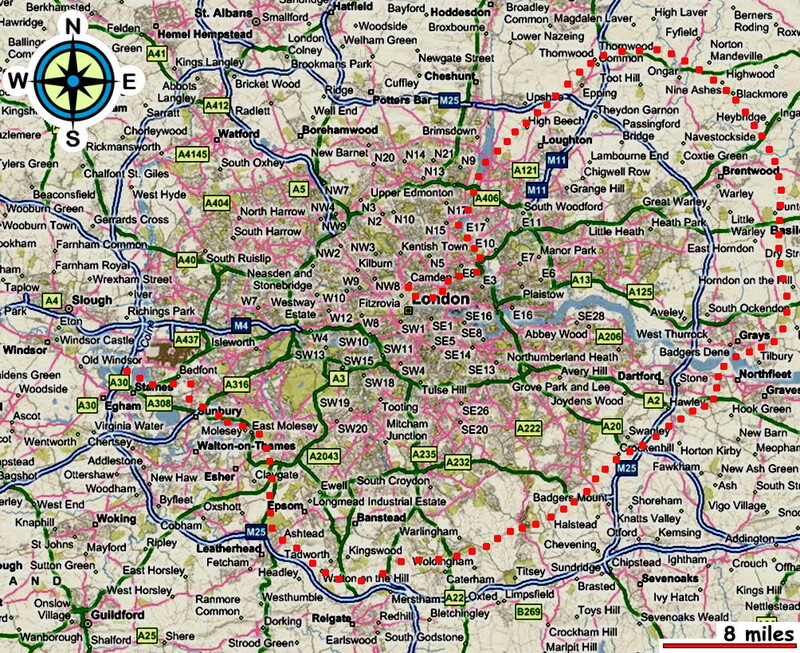 Since the whole of Surrey is south-west of central London it's actually not possible to get from anywhere in Surrey to anywhere in central London by heading south: we must assume that the Order flew around in a big loop. But it makes marginally more sense from northern Surrey than elsewhere in the county, since at least we can say that by heading south they were skirting central London, rather than heading off into the countryside. They go straight up above Little Whinging; then fly fast and more or less eastwards (as we know because when they turn south it's to their right) for an unspecified time; bear south to avoid a town; bear south-east to lose themselves in clouds; fly on for an unspecified time which must take them north-east if they are to end up anywhere near King's Cross; then turn south-west, which ought to mean back towards Little Whinging, to avoid a motorway; then fly on for another unspecified period; then they are nearly there. If we assume they start from a point south-west of Stanwell Moor, in between the Wraysbury and King George VI Reservoirs, they might fly east-south-east across the King George VI and Staines Reservoirs, pass between Stanwell and Ashford, and fly due east for about two miles across the open land and ponds south of Heathrow. 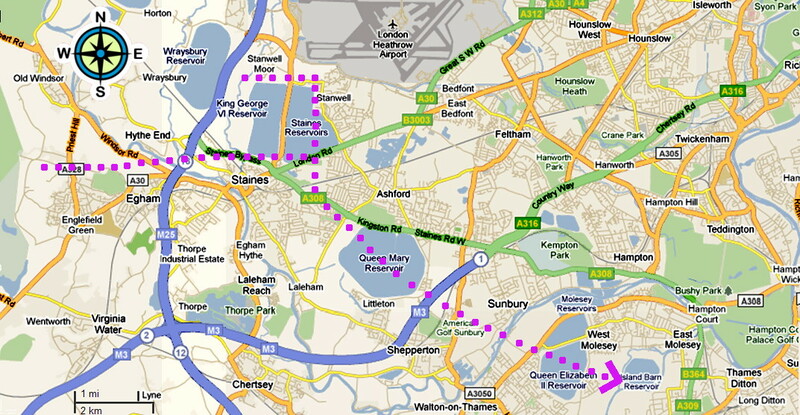 They would then come to the outskirts of Feltham, with Twickenham and Hounslow beyond it. Turning briefly south and then south-east they would pass to the south of Feltham, crossing open fields and then Kempton Park, and then pick up the cloud cover either over the Bushy Park/Hampton Court park area, or over the group of reservoirs around Molesey. Or, in the less likely chance that Little Whinging is in the far north of Runnymede, they might head east across the north sides of Englefield Green, Egham and Staines, pass along the southern edge of the George VI and Staines Reservoirs and across the open ground south of Heathrow, thereafter following the same course as above. Alternatively, starting from near Stanwell Moor they might fly due east across the top of the George VI and Staines Reservoirs, turn south to avoid Stanwell and Ashford and then pass between Ashford and Staines, heading south-east across the Queen Mary Reservoir and the open land south of Sunbury, and picking up the cloud cover over the complex of reservoirs at Molesey. Or again, starting from a point just west or north of Englefield Green they might pass along the northern side of Staines and then join into this same course, turning right at Ashford. If they are so keen to avoid flying over towns then presumably they won't want to fly over central London either. One can only assume that they fly right around the south and east sides of London and enter it again from the north-east, allowing them to stay over more-or-less open countryside as far as Chingford Mount, south of Brimsdown, which is about eight miles in a straight line from Islington. The motorway which they veer south-west to avoid would be the M11, which runs slightly south of south-west from the Epping area into London. If they followed the green land alongside the M11 they could get as far as Woodford, quite a long way in towards the heart of London, cut almost due west across about a quarter of a mile of dense housing to open land on the south side of Chingford Mount, and then follow a succession of reservoirs and then Walthamstow Marshes - now the site of the 2012 Olympic stadium, but at that time open, wild land - around a curve south to Hackney Wick and thence to Victoria Park. 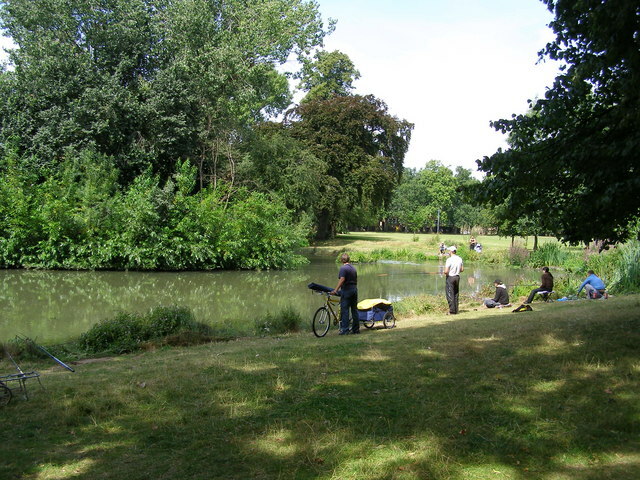 But by angling away from the course of the motorway, they could pass over Epping Forest and pick up the same chain of reservoirs in the vicinity of Brimsdown, just north of Chingford, without the necessity of crossing over housing at all. In order for a south-west course to take them away from the motorway (rather than parallel to it) and towards the reservoirs without crossing over houses, we must assume that they had swung quite wide of London and that when Moody told them to veer to the south-west they were in the vicinity of Thornwood and (really) Potter Street. It takes them in a very wide loop away from the city, but one can see that if they started by swerving to the east as they approached the Thames, to avoid Dartford and Grays, then they might pass on the east side of Brentwood as well and then find themselves following a wide curve which took them around the north side of Chipping Ongar, before turning back towards London. If they're going to Camden or Holloway, then from Victoria Park they would have rather further to go: three or four miles as the crow flies. But they could take a loop south and make most of that journey over the Square Mile, which is largely deserted late at night, apart from people in pubs who would put it down to the booze anyway. It's a very large detour – about seventy miles around the edge of London instead of seventeen miles across it, just to cut the distance spent crossing built-up areas from fifteen miles to three or four – but it does make sense of what we're told, including the fact that they seem to be flying fairly fast and yet they take (in Harry's opinion) an hour or more to get to the point where they veer south-west away from the motorway. If Harry is right it would give them a speed of around fifty-five miles an hour, which seems reasonable. You do have to wonder why they would go round the south side of London instead of the north, which would have been slightly quicker - but wrchis of the Loose Canon discussion group has come up with an elegant explanation which makes perfect sense, assuming Little Whinging to be in the Stanwell Moor area. "If they start out from somewhere in the Stanwell area they would pretty much have to go east and south since to go north they would have to circle around west quite a ways to avoid the Heathrow air traffic corridors. The radar close to the airport would actually pick them up like they were birds and the flying motorcycle would look just like an ultralight wandering into heavy traffic which would cause a stir at the very least. Even just the brooms looking like birds would tend to attract more radar in an attempt to precisely locate them or scare them off (birds can sense strong radar beams on them, it is sometimes used to clear runways of them). "At that range higher frequency short range radar can make out a surprising amount of detail and it would be recorded (which could cause headaches for the ministry later on) and could even trigger some kind of emergency response if the they were mistaken for some kind of slow cruise missiles or something. If they actually passed low over the airport itself they would definitely show up on ground control radar which has enough detail that it looks a little like thermal imaging. "Also unless they were hugging the ground turbulence from large jets taking off or landing would be a danger. I have seen small aircraft weighing around a ton thrown around like a paper aeroplane hitting a fan stream even after a minute or so after a large jet passes; I imagine it would be a lot worse for a person on a broom or motorcycle. "The stacks (those capsule shaped ovals) are rather high up (7,000 feet or a little over 2 kilometers minimum) so they could pass under them without problems since the radar operators would ignore something at a few hundred feet at that point unless it looked like it was ascending into traffic lanes. The biggest danger would be on the takeoff end (most often to the west) and the final approach corridors which would be straight east along the line of the runways out to the outermost turn. "If for some reason they had to enter the takeoff corridor much before the first turn or so they would have to stay very low, flying in the ground clutter around treetop level. "Another thing that would make a southerly course the better choice would be that the Death Eaters seem to be less in touch with the muggle world than others and without taking the air traffic control devices like radar (and probably little or no notion of the turbulence a big jet makes) a northern route would probably seem to them to be better due to it being shorter so in theory they would probably place more spotters or whatever in that direction." On days when the planes were running in the Westerly pattern, the route which I have suggested would start from a point just outside and east of the path of the ascending planes, then run roughly parallel to one of the take-off routes (green band at bottom left of picture) before passing under the edge of a stack (red oval) about twelve miles out from the airport, by which point the planes should be high overhead. They would pass back under two incoming flight-paths as they entered north London (red bands and ovals at top right of picture), but this would be fourteen miles out from the airport, and there are so many helicopters, helium balloons and flocks of pigeons in central London that the broom-party wouldn't be likely to attract attention. Alternatively, it has been suggested that when Harry caught the train from Paddington he was going home, not to the island, but he was heading in the first instance not for Little Whinging but for Vernon's office at Grunnings, there to wait until Vernon finished for the day and could take him home. Grunnings would then be in the major Berkshire towns of Reading or Slough, both served by the main line from Paddington, and Little Whinging could be anywhere in north Surrey that was in reasonable commuting range. It would still need to be in the north end of Surrey to make any sense of the route Harry and the Order take from Privet Drive to Grimmauld Place. 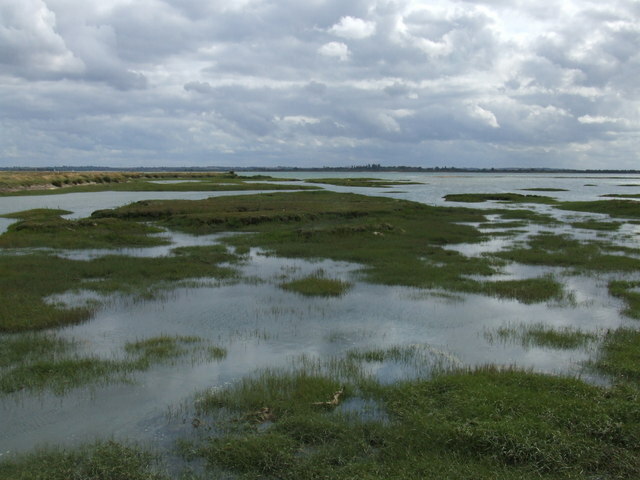 The island Vernon took the Dursleys and Harry to in PS is probably in or near the Blackwater Estuary on the coast of Essex, east of Chelmsford. To get to Diagon Alley Harry and Hagrid caught a mainline train from either Southminster, Alresford or Wivenhoe to Liverpool Street station, where they caught a Central Line Underground train to Tottenham Court Road station and then walked down Charing Cross Road from north to south. 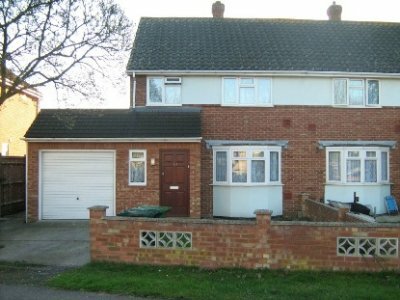 If Harry was heading straight for Little Whinging after his first trip to Diagon Alley, then Little Whinging is either another name for a probably-enlarged version of the village of Stanwell Moor near Heathrow airport, or it is a fictional suburb next to and south-west of Stanwell Moor which does not exist in the real world. To get there from Paddington station Harry caught a Great Western Line mainline train to Iver station near Richings Park in Berkshire, and then took the M25 motorway south for a couple of miles to Little Whinging/Stanwell Moor. This presumes the presence, in the Potterverse, of a slip-road giving easier acces from Iver station to the M25 than exists in real life. To get from Little Whinging to Grimmauld Place Moody, Harry and the Order flew across the reservoirs near Stanwell Moor, then turned south to avoid one of the towns in the area, bore south-east and then skirted the southern and eastern borders of London before turning back and approaching the city from the north-east. 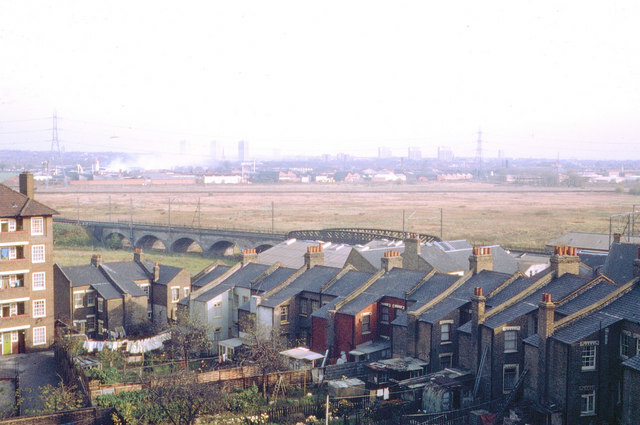 They crossed and veered away from the M11 near Thornwood, flew over Epping Forest and followed a series of reservoirs and mudflats almost as far as the Thames before turning right across Victoria Park in Hackney, whence they then had to cross two and a half miles of built-up housing. If Harry was heading for Grunnings in Reading or Slough after he left Diagon Alley, then Little Whinging could be anywhere in north Surrey but it would still be within about ten miles of Staines, and a journey starting from there could still join in with the route I have shown around London, travelling due east for some miles and then picking up the route somewhere south of the reservoirs.